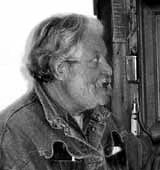 JEAN-JACQUES LEBEL, born in 1936, in Paris, France. Worked as an artist and art-critic and organized exhibitions in the dadaistic movement together with Arturo Schwarz and others. Social-political assemblages, collages and performances. Took part in the Involvement Show and the Doom Show 1960/61 at March Gallery in New York. — Lives in Paris.